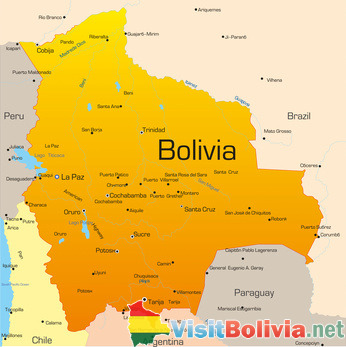 Bolivia is a landlocked country in South America, bordered by Peru, Chile, Argentina, Paraguay and Brazil. It is situated in the heart of the Andes Mountain region, with the majority of its population living on the high plateau, the altiplano, between the Western Andes Range, which spans its border with Chile, and the Eastern Andes Ranges, which cuts across the country. While much of the country is consists of the mountainous regions, there is plenty of geographical diversity in Bolivia. In the valleys east of the Andes, some of the most beautiful garden areas in the world abound, especially around the cities of Sucre, Tarija, and Cochabamba. The pleasant climate, coupled with spectacular scenery, makes these areas an ideal destination for tourists. Still further east, lush tropical and subtropical rain forests, still inhabited by indigenous Amerindian people groups. The largest and most accessible cities in the tropical region of Bolivia are La Paz and Santa Cruz de la Sierra. Spanish is the official language of Bolivia, spoken by 87% of the populace. Several indigenous languages are also spoken, with Quechua and Aymara being the most common. While Spanish is the official language, it is a second language to a significant portion of the population, especially native peoples. Even amongst Spanish speaking Bolivians, many words and phrases have been borrowed from the local Amerindian languages, making Bolivian Spanish somewhat different from that of Spain or even other Latin American countries. Much of the shopping in Bolivia is conducted in open air markets. These markets, featuring vendors in traditional dress reminiscent of the Spanish Colonial period are a favorite attraction of many tourists. Colorful festivals are featured in even the smallest of towns on fiesta days, featuring parades and traditional music and dance. Most of the festivals feature a blend of Spanish Catholicism and indigenous religious beliefs. The most famous of these is the Carnival de Oruro, recognized as one of the world's premier masterpieces of human heritage. Bolivians are fond of football (or soccer, as Americans refer to it) and table football. It is not uncommon to see football games played outside on street corners. Adults and children alike revel in this favorite pastime. Nearly two thirds of the population of Bolivia are full blooded Amerindians, descended from the Inca Empire. The population is rounded out by Mestizos (of mixed Indian and European ancestry) and Spanish, in addition to several smaller Amazonian indigenous people groups. The blending of Spanish Colonial influences with that of the native people has produced a distinctive form of architecture and art known as Mestizo Baroque. While the people of Bolivia have been historically divided along cultural lines, reforms made over the past century and the recent election of the country's first indigenous president have begun to move the Bolivian people towards a greater sense of equality.